1- Chelsea, what's your favorite Disney trivia question to stump others with? Chelsea - My Disney trivia superpower lay in song guessing. Give me the first five seconds of any Disney song, and I’m already singing the chorus. But for this question, I’ll go with: What are the three fairies from Sleeping Beauty? Don't worry, the answer is at the end! Think instead of seach, dear readers. 2- Anstice, you're an INFJ. I'm an ESTP. 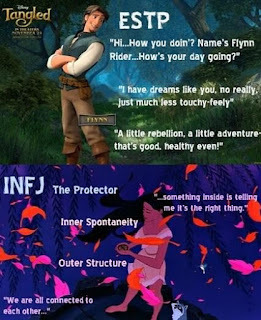 We're Myers-Briggs opposites. Do you ever use the personality test when writing fictional characters? Anstice - I do, all the time! I think it’s a great tool for figuring out a character’s potential reactions to different situations. I have a huge chart I like to fill in to get to know my characters better, and it includes their MBTI type, Hogwarts house and Divergent faction. 3- Would you each please, in 160 characters or less, give a #WriteTip ? Chelsea - A crappy first draft is better than a non-existent one. Anstice - Read as much as you can, including genres and forms you don’t write in. 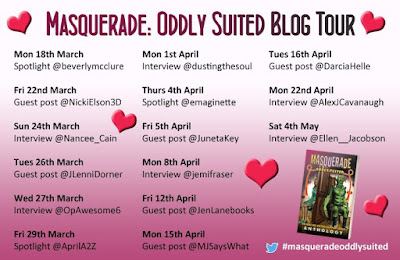 4- What was your inspiration for the story in Masquerade: Oddly Suited? Chelsea - I have this whole anecdote about Bing images but I’ll simplify it for you. A few days before the end of the contest, I read about a lake you can windsurf on in Italy. It spawned an epic google hole and I thought it would be a really lush, exotic place for two love birds on the run. I sprinkled in some dystopian vibes, added a villain, and voila! Remedy. Anstice - I was pondering the different meanings of the word ‘masquerade’ for weeks and I had a vague idea about a shapeshifter who was never seen in her true form, and how she felt alone and misunderstood. The feeling of loneliness led me to imagine a remote Scottish island. Then I began thinking of creatures from Scottish mythology like selkies and kelpies, and my main character shaped herself into a siren. 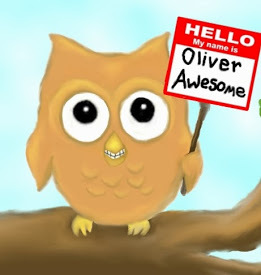 5- What are your Twitter handles, and do you have two friends each on there to shout-out to for #WriterWednesday ? Chelsea - My twitter handle is cecerumba. It’s a nickname my mom gave me when I was a wee babe. 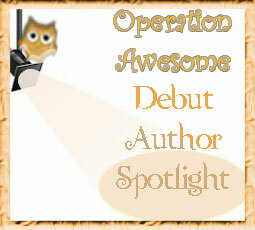 As for #WriterWednesday, I just did #febfrenzy with @LacieWaldon and she’s amazing. Also @jendwrites! 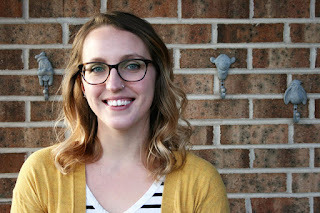 She’s a local author I met at an expo, and she’s been a huge help with every step of the process. Definitely good follows. Anstice - My twitter is @AnsticeBrown. Shout-out to @miladyronel who writes imaginative fantasy and folklore and @JazzFeathers, who writes unique historical fantasy set in the 1920s. Both are amazing writers who always leave thoughtful and supportive blog comments. Anstice, I know Ronel and Sarah too! They're awesome. Small world. 6- Chelsea, my fellow Pennsylvanian, would you share a picture with us of your favorite local food or place? Chelsea - Fellow Pennsylvanian! Woot woot! You mean besides my local library, right? My favorite local place is my alma mater, Arcadia University. Specifically, Grey Tower's Castle. 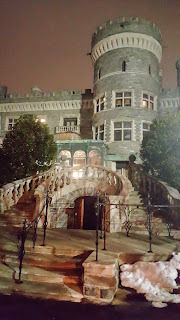 It’s beautiful and near Halloween, they give ghost tours about the tunnels under the campus and the general creepiness of the castle. There is also some delish vegetarian General Tso’s at Queen’s Sushi in Keswick if you’re ever in the area. 7- What's the best part of being in the Harry Potter fandom? Chelsea - Oh man, I love the way the Harry Potter fandom transcends boundaries. You could be the sportiest jock or the smartest computer whiz but ask them what house they are from and suddenly everyone is debating Draco’s character arc. Plus, Hogwarts is always my home. I don’t think I’ll ever get tired of rereading the series and experiencing the magic over and over again. Anstice - I second what Chelsea said. It’s such an inclusive community where anyone is welcome. The mystery, magic and adventure in the books are something all ages can enjoy. Plus, there are spin-offs like Fantastic Beasts and a wealth of fan-fiction to keep us going forever. Chelsea - This is going to be the worst thing I’ve ever said, but the cover. I know, I know! I shouldn’t judge, but I am a sucker for a pretty cover! Recommendations too. But if I pick it up and read the back I’m usually sold. Anstice - A recommendation from one of my favourite book bloggers usually ignites my interest. But I get drawn in by beautiful covers too, especially if they have a mythical creature on the front. Love because: it’s a time travel young adult novel centered around realistic witchy-ness and out of control powers and angst. Realistically, it has everything anyone into paranormal young adult fiction could ask for. It’s also one of my all-time favorite books. I’m pretty sure I’ve read it a million times. Love because: it’s filled with interesting and funny characters, unique mythology and epic romance. I fell in love with Taylor’s beautiful, lyrical prose by the end of chapter one. All her books have the same dreamlike quality. 11- Anstice, congratulations on ten years of blogging. What's the best tip you have for a blogger who is just starting out? Anstice - Thank you! My advice is not to put too much pressure on yourself to be “successful”. Most blogs don’t gain hundreds of followers overnight, it’s something that happens gradually when you build a relationship with your readers. You don’t have to post every day or say ‘yes’ to every review opportunity-go at your own pace and enjoy it! Chelsea - Allmyfriendsarefiction is amazing. She legit made a book throne. Twice. Also, I’m a sucker for a good shelfie. I mostly just alphabetize because I’m neurotic so seeing beautiful bookshelf displays warms my heart. 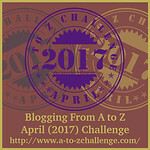 Anstice - I love mo_the_bookish for her light and pretty pics filled with flowers. Foldedpagesdistillery always includes such interesting props and oliviascatastrophe is so creative with her editing. Small world getting smaller! I follow Olivia on Pinterest! 13- Anstice -Would you share a picture with us of something with a "Pride of Britain" style? 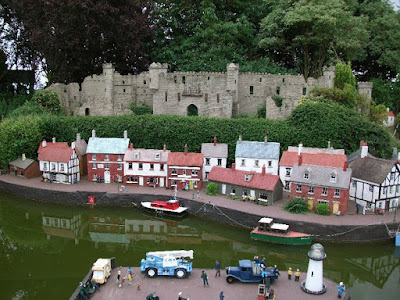 Anstice - Here is a picture of the quintessentially British Bondville Model Village in Yorkshire which I visited a few years ago. 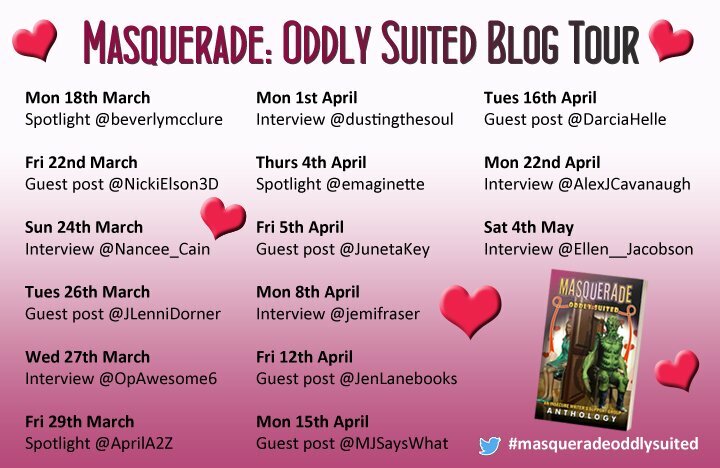 14- What is the most memorable trait or visual oddity of one of your characters from Masquerade: Oddly Suited? Chelsea - I’d have to say my characters masks. We’ll go with Remy. He’s got this pigeon mask and the way I imagined it, it was made of drab, gray feathers but when he turns his head, the feathers had a rainbow sheen. Kind of like him: full of hidden beauty. Anstice - Probably the way the sirens in Sea of Sorrows communicate telepathically with each other. They have a very close bond and can sense each other’s emotions. Chelsea - Diversity, in my option, is more than race or skin color. It bridges mental and neurodiversity as well. In Remedy, one of my characters suffers from an anxiety attack of sorts, despite looking “normal” on the outside. Despite being strong and sassy moments earlier. I think it’s important to be aware of #ownvoices and anxiety is something I’ve always struggled with, so it felt the most organic to incorporate that kind of diversity into Remedy. Anstice - Sea of Sorrows is centred around the female experience and could raise questions about how young girls are expected to appear and behave, and how they can be used by those who seek power. But Mairg’s feelings of being isolated and treated as ‘other’ by those who don’t understand her could relate to many diverse experiences. The story was also partly inspired by my own past struggle with depression. Chelsea - I’m a big fan of my friend from college, Meghan Wright at #ohwrightreads. Her reviews are short enough that I can read them while browsing Instagram or Facebook but through enough to convey plot and feel of the book. I’ve picked up many a book because of her and crossed some off my TBR list too. 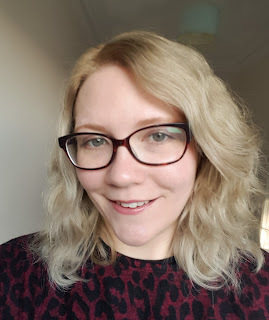 Anstice - There are so many book bloggers I adore, but my must follow blogger is Amber of The Literary Phoenix (https://theliteraryphoenix.com/ ). Her tastes are so similar to mine and her reviews are always detailed and well considered. I’ve read several books on her recommendation. 17- What's your favorite part of the IWSG? Chelsea - The support. After I finished my first draft of my first novel, and I went …uh now what? I found the IWSG. 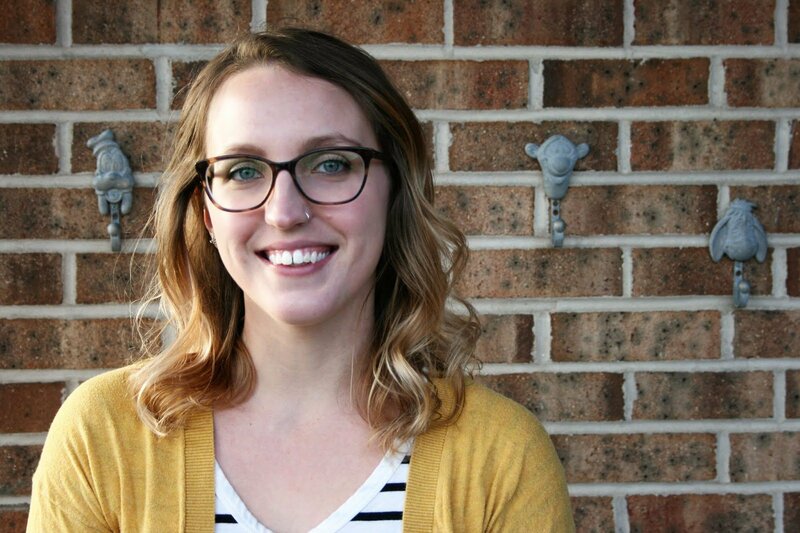 I read about imposter syndrome and how I wasn’t alone in feeling like I wasn’t a “real” author. I wasn’t alone in feeling like my work wasn’t good enough or being cripplingly insecure. So, I stalked the posts and gathered up every bread crumb of advice I could. Now, I’m a little bit more involved and busier, but I still like to check in for the first Wednesday of the month posts and read the articles posted on Twitter. Anstice - I agree with Chelsea; the IWSG is so supportive and always there to provide helpful advice and constructive feedback. Taking part in the various challenges has encouraged me to ‘come out of my shell’ as a writer and have the confidence to share more of my work. It’s reassuring to know I’m not alone in feeling insecure about my writing sometimes. Chelsea - I didn’t understand the importance of reviews until I wrote a book. Yes, reviews help sell. Yes, reviews boost ratings and turn other people on to a novel. But as an author, I just want to know what people thought of my book! If they had a favorite character or if they especially hated the car in scene three. It boggles my mind that we can reach out to authors and let them know what we thought of the musings from their head. The world is a magnificent place. Anstice - Reviews are a great way to help your favourite authors gain more visibility, and also to introduce others to wonderful books they may not have heard of. I always read reviews on Goodreads before I buy a book to get an idea of whether I will like it or not. I’m not sure I’m brave enough to read reviews of my own work, though! And hey, Chelsea, what was the answer to the trivia from question one? 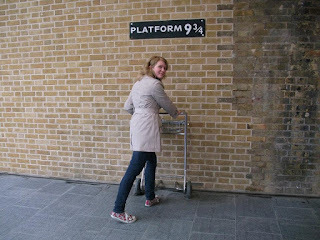 Chelsea - Get at me with your Harry Potter comments! I ship Dramione and I am ready to defend its honor with my life! But seriously, what do you guys like to see from your authors? Pretty bookstagrams? Blog posts? Funny tweets? What makes you feel connected with not just their book but them? The answer is Flora, Fauna, and Merriweather. Sleeping Beauty is my favorite princess because napping is what I wish I could do every day and Maleficent is the legit best Disney villain. If I didn’t get invited to a party, I would totally curse an entire kingdom too. Anstice - Who are your favourite authors? I’d also like to know what topics you enjoy reading on author blogs. 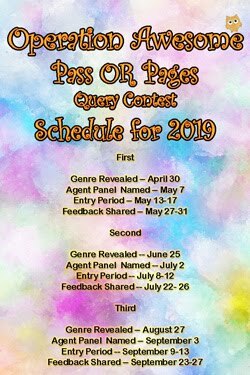 Do you like to read articles about the writing process, discussions of other books or do you prefer excerpts and flash fiction? Born with privilege in the Protected Lands means money, power, and ease. For Remy, it means forever being apart from Rudy. On the night of the Masquerade Ball, Remy must choose between duty and heart. Which will prove stronger? Rudy always asked rhetorical questions. Are you sure? Did you mean that? Can I kiss you? He meant well. He was sweeter than the chocolates we stole from the kitchens. Sweeter than the apple pies the cooks made, their fingers calloused and dried from the years of servitude. Sometimes, that sweetness grated on me. Though I would never have said that to his beautiful face. His face remained pristine and unmarked despite the time he’d spent as a pigeon. Most of the time, masters marked their pigeons; often on their faces. The brands showed ownership and status. The more important the master, the more pigeons he owned, scattered throughout the city, as they delivered messages. But Rudy’s face was gracefully unmarred. Smooth, olive skin. Playful, green eyes. Dark, tousled hair. A sloping nose carved his face in half trailing down to his full lips. Lips he bit now as he waited eagerly for my answer. With those eyes on me, I forgot where I was; who I was. The hued light from the ball filtered through the stained windows, casting colors over his soft skin. His eyes sparkled in the light as he dissolved into soft laughter. Everything about him was soft, his hands, his eyes, his laughter. The product of an eternity of blending into the background. I ease myself from the sea floor with a flick of my tail, and a flurry of dark sand turns the water murky. As I swim toward shore, my tail sears and splits into limbs and my gills heal over. I push towards the surface, desperate for breath, and propel myself forwards until I collapse onto the dark sand. I stagger towards the cliffs on my webbed feet, the icy wind clawing at my bare body. I retrieve my lantern from a crevice in the rock and light it with a match. The soft glow of the candle comforts me, though a creature such as me has nothing to fear from the darkness. Settling myself onto a rock, I sing. I wish I didn’t need to do this. But the promise of release is irresistible and soon my pain pours out of me and into the melody of the song, rising high into the night like the crest of a wave. This is no love song, no elegant ballad. It is the song of the abandoned, the hopeless, and the forgotten. The notes rush out of me like a restless tide, plummeting lower and lower until they reach the depth of my loneliness and fade away into silence. This was a fun interview. Interesting that we follow some of the same bloggers/writers. 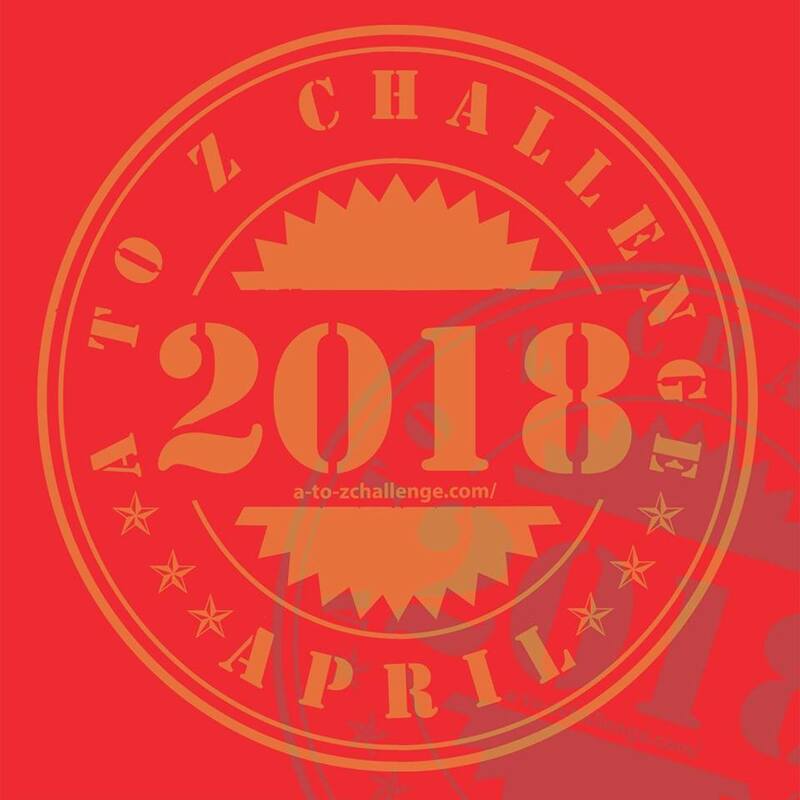 I think I met many of them through the A-Z challenge, so that makes sense. Thanks so much for having us, J! Chelsea-I'm a fan of The Good Ship (Hermione/Ron) and I will go down with that ship! This was a super cool interview! Answering the questions was the highlight of my day. It was also fun to see Anstice's answers. Thanks for hosting us, operation awesome!! Anstice- I have an insanely horrible Dramoine fanfic floating around in the internet ether that will totally change your mine. �� As a nerdy girl myself, I love my bad boys!! Ha ha, I will have to have a hunt for that! I do admit they have chemistry. I have read some really good Drarry and Wolfstar fic. What amazing interview! I enjoy getting to know the authors I share the book with. If only we could have lunch, that would rock! Me too. Coffee and cake would be great! This was a great interview! Hogwarts is my home, too, even if I never did get my letter. It just got lost in the mail, right? What an informative interview! I especially enjoyed the unique questions (I'm an INFJ-ISFJ depending on when I take the MBTI), the writer advice, the reasons for reviews, and the excerpts. I think it was entertaining how everyone realized how much they had in common as the interview went on. Great learning more about Chelsea and Anstice. I love the picture of Grey Castle Tower. How cool! Why publish short fiction if I'm a novelist? Why write short fiction if I'm a novelist?